Back in the 70’s I used to sell a lot of woven wood shades. They looked a bit different then because many of them were full of yarn. Hence the name “woven woods”. The yarns were woven through the wood reeds creating a material used most commonly for roman shades. Think golds, moss greens, and a bit of orange and the old memories will come flooding back. This heavy look fell out of favor when the clean crisp look of mini-blinds and verticals came along. As with all things, the wovens have come back into fashion with new twist. Grasses and naturals are definitely IN right now and many of the new wovens have that ZEN look. I never thought I would see the day when woven wood draperies would make a come back, but Hunter Douglas has brought them back into vogue. There are indeed improvements to the old look, which often involved clumsy wood pole rods and ungainly wood rings. Now the headrail is streamlined and easy to pull. Your drapery includes a valance. 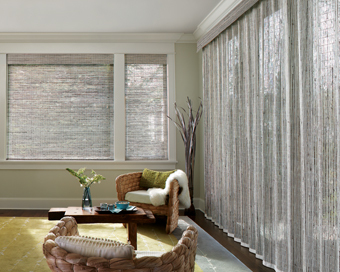 Come in and look at our new sampling for woven wood shades and draperies. The vertical drapery is especially appealing for sliding glass doors when a standard drapery or vinyl vertical just doesn’t work with your decorating finesse.